In the year 2016, 460 people had an accident with their bike, 36 more than in 2015 in the city of Zurich alone (Source: City of Zurich). Bikeable.ch wants to make the traffic safer: It is an online-platform for cyclists. It allows them to show the worst spots in the city and propose solutions at the same time. This is how it works: you take a photo of the spot and upload it to the page with a title and a comment. These spots are then visible on the map. You and the other users vote for the spots and the most urgent ones are shown in the «Wall of Shame». Good examples are shown in the «Wall of Fame». You can discuss the spots with the bikeable-community and look for solutions together. What’s the goal of bikeable.ch? Our goal is to give cyclists the possibility to help advance the development of cycling infrastructure. We show the responsible administration where change is necessary and which solutions are the most popular among its users. In the long run, it should help making cycling safer, faster and more comfortable. It works already all over the world, we just focus on Zurich and its surroundings. Bikeable.ch needs a community. To bring these people together we want to advertise, make stickers, flyers and posters and advertise online including social media. For the IT infrastructure and to build our website. A website that makes the roads for cyclists safer. With your active help in the bikeable-community, you can actually make a change. Perhaps thanks to your input the useless driving ban or the dangerous edge will disappear. If you support us with a reward of more than 50 francs, we will enter your name on our website. (If you wish). At CHF 15’000 we’ll translate the site directly to English, French and Italian! CHF 20’000 and we’ll make an native app with additional functionalities! This project ended successfully on 7/5/2017 14:00! Thanks! You get 10 fancy bikeable stickers. Bam! You’ll get a handwritten postcard from our next (bike-)holidays in your mailbox! Yeah! You’ll be an exclusive beta-tester for our website and can help us completing it with your feedback. Ou la la! We clean your bike for you so it shines and sparkles in the spring sun and you'll be an beta-tester. Party time! You’re invited to our bike cellar festival in Zurich Wipkingen on the 28th of April and on top of it become a beta tester. Write us (info@bikeable.ch) and you'll get the details. Yes! We’ll take you on a bike tour through the city including a coffee break in our favourite cafe and you become a beta-tester. Cool! We take you on our favourite bike tour including a picnic on the go! And of course, you'll be a beta-tester. Fame! Your (bike-)store will be displayed in our map and you’ll appear with your logo on our website for lifetime! Wow! We invite you with two friends to a seasonal four course menue. The ingredients we’ll of course shop locally with our bikes. And you'll become a beta-tester. 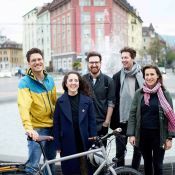 We are five young people living in Zurich who enjoy biking a lot and would like to do it even more.